Four Velcro-secured flaps conceal 40 individual weight pockets, which keep the removable weights from bouncing or shifting during movement. 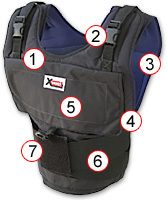 Each Xvest 4040 has a total of (40) individual weight pockets concealed beneath four Velcro-secured flaps on the front and back of the vest. 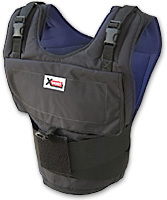 Included with the Xvest are a set of (40) 1-lb cylindrical weights, which can easily be added or removed, based on the athlete's needs.